‘Tis the season, making the list, checking it twice, some people are naughty, some are nice and most are caught up in the do more, see more, have more, go more, eat more, drink more and stress more mentality. Holidays can be hell if you let them. 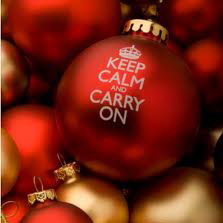 Here are some of my favorite survival tips to help you thrive and enjoy the holiday season. • Do you really need to decorate to the fullest extent possible or can you do with a more moderate, toned down holiday décor? • Simplify your gift giving; shop locally to support local merchants who are struggling in this economy. The experience can be less time consuming and more personal. Do you want to live in a town where all of the shops are empty? • Shop online, buy gift cards or personalize items, which can make something ordinary, extraordinary.